Camping Les Lacs du Verdon - Luxury camping at beautiful Les Lacs du Verdon! Camping luxury in the heart of Provence: Les Lacs du Verdon is situated in the Var department of the Provence-Alpes-Côte d'Azur region, in the southeast of France. Discover castles and coastlines in the heart of Provence at Lux-Camp’s luxury camping site, Les Lacs du Verdon. Book you next luxury camping holiday at lux-camp.co.uk. Welcome to Camping Les Lacs du Verdon! This area has been popular with tourists for centuries, thanks to balmy weather, sunshine, and the warm waters of the Mediterranean. With striking natural features like the famous Gorge du Verdon, and a long coastline of beautiful beaches, there’s something for everyone. 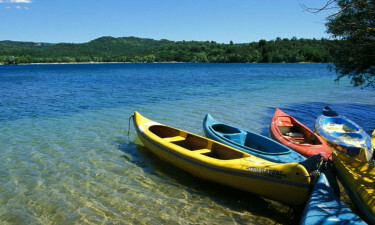 Why pick Les Lacs du Verdon for a camping holiday? LUX-camp luxury camping sites are ideal for families. A mobile home makes a quiet, comfortable base for days as lazy or action packed as you want. 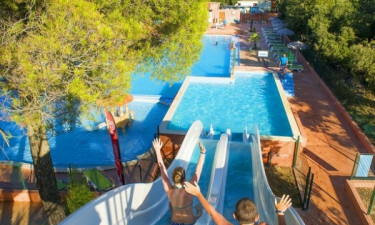 The Lacs du Verdon site has everything you need for fun, with entertainers and play areas for children, a gym for keep fit enthusiasts, and tennis and mini golf for the whole family. Furthermore the campsite has an extraordinary poolarea with new and big waterslides. Also there is to be found a childrens pool with water equipment that the children can play with. There’s plenty to see and do in the Var. The area around the Gorge du Verdon is a paradise for climbers and hikers, with pretty little hilltop villages and spectacular views. You can even do your sightseeing from above in a hang glider. The seaside has everything for the watersports enthusiast, as well as pedal boats for family fun. A boat tour along the coast is a wonderful way to see the region. There’s no shortage of places to eat, whether it’s in Régusse itself or further afield, in one of the many historic towns or quaint little villages of the region. For convenience, though, you can’t beat the restaurant on the campsite itself, just a short stroll from your mobile home. 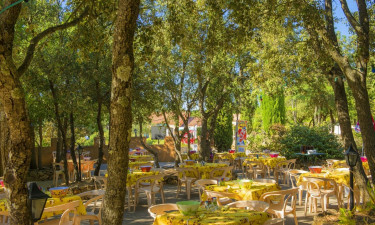 It’s the perfect place for a meal with your family, but if you prefer to grab a bite to eat and get on with your day, you will also find snack food outlets on site. The camp supermarket is available for all your needs, from groceries so you can prepare your own meals, or go on a picnic, to everyday essentials, to buckets and spades for the beach and postcards for friends and family.